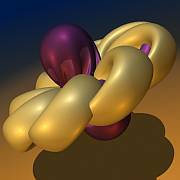 "Not Knot" and "Outside In"
Can you find 4 loops in space so that if you remove any one of them the remaining 3 fall apart? How about n? Can you describe life on a cone with cone angle bigger than 2π? Much bigger than 2π? Describe the n-1 paths from a point to itself on a 2π/n cone. What do they look like on an actual 3D cone? When they say in the movie, "what's life like on a disk with a point removed? ", what assumptions are they making about "life"? Why isn't the answer just "it's the same but with one point missing"? What's hyperbolic space? How did our cube suddenly turn into a dodecahedron? Can you see a precursor of that dodecahedron already on the original "cube with axes"? At the higher order symmetry tilings of hyperbolic space with dodecahedrons, what happens around the white edges? 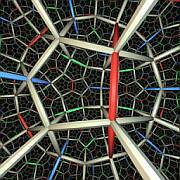 What's a "rhombic dodecahedron"? Can you "see" it on the "cube with axes"? Did you see π1(S1)=Z in the monorail pictures? Why can't a bowl come near a dome? In what sense are they "repulsive"? Are there forced saddles when they come together? Where are they? What exactly went wrong with the 2D corrugation argument when turning numbers didn't match? What's the belt trick got to do with π1(SO(3))=Z/2Z? Can you make the word "corrugation" in 3D more precise? Given two bands dancing in tandem, can you describe the corrugation connecting them in explicit terms? Can you make the statement "corrugations provide flexibility without pinches and creases" precise? How come the thing that failed in 2D with corrugations doesn't also fail in 3D? I.e., how comes the "uncorrugation" phase works in 3D after it (sometimes) failed in 2D? Thanks, Rich, for help coming up with these questions.